Al-Qadhafi asked the technicians to start their daily schedule of programmes with the reading of verses of the Qur'an. The next step was to connect the Benghazi station with the Tripoli radio, and from Tripoli came strains of the martial music. Tripoli unlike al-Baida was under the control of Abdussalam Jalloud, Abdel-Munem Al-Houni and other free officers. When a senior official from the Ministery of Information called Benghazi station inquiring why military music was being transmitted instead of the usual "Sabahil-Khair" light music programme, Lieutenant Abde-Fattah Younis answered: " the country is under the control of thee army". "Sons of the beduins, sons of the desert, son of the ancient cities, sons of the countryside, sons of the villages, the hour of work has struck and so let us forge ahead ..."
Inside the radio station in Benghazi, Mu'ammar al-Qadhafi switched off the microphone. He just broke the news to Libya, and the world, that the country's constitutional monarchy and the government of king Mohammad "Idris" al-Sanousi, then on vacation in Ankara Turkey, had been overthrown in a bloodless revolution. Recognition of the Libyan Arab republic , as the country was called, came almost immediately from Iraq and Egypt. Other countries, especially Western Europeans ones, at first hesitant to recognise the new Libyan Government, were to follow suit in a relatively short period of time. 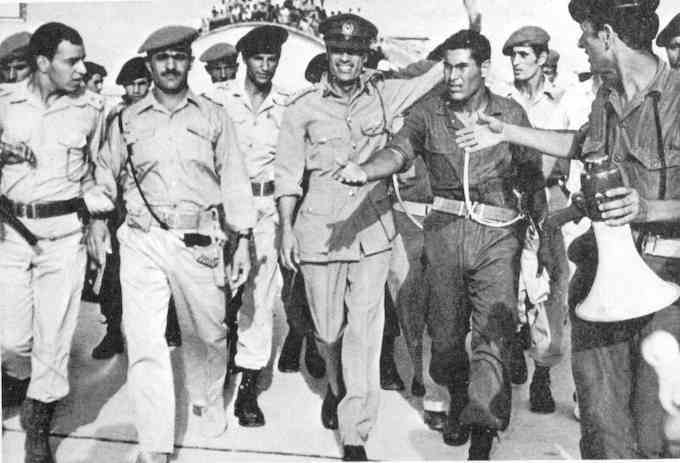 During the first few days of the revolution, when the country remained completely cut off the rest of the world as the revolutionary officers closed themselves inside Bab al-Aziziya barracks in Tripoli, little was known of the young men who has mapped out and executed the coup. The name of Mu'ammar al-Qadhafi, was to become known to the world almost ten days after the revolution itself. Most of the Members of the RCC are not in power anymore. Emhemmed al-Mghariaf was killed in a car accident. Omar al-Mhaishi left Libya and started a radio programme [in Cairo and Tunis] against al-Qadhafi, it is believed that King Hassan of Morroco handed him to al-Qadhafi and was executed upon his arrival to Libya. Hawwadi, Hamza, al-Gherwi ,Najm, Jalloud and al-Kwaildi al-Hmaidi left the RCC but not the country. Abdel-Munem al-Houni left the country and joined al-Qadhafi's opposition abroad. Late 1969 and early seventies some officers tried to overthrow al-Qadhafi's regime but with no success. In the early years of the revolution, most of the country supported the revolution, Libya is not far away from the center of Arab nationalism in Egypt and its leader Jamal Abdul-Nasser who died in 1970 after announcing that Mu'ammar al-Qadhafi is the new leader of Arab Nationalism. Al-Qadhafi tried hard to make Nasser's prediction come true. He succeeded in gaining the support of many Arab and International revolutionaries who made Tripoli their center, but as Arab and International revolutions faded, those supporters ended up permenant residents of Tripoli and Benghazi luxurious hotels bathing under the silky Libyan sun and talking about the spicy Libyan food and of course they talk about revolution !! But, when Libya ran out of money and resources due to government mismanagent and bad planning and due to international sanctions, the very al-Qadhafi supporters left the country and some of them are now writing their memoirs against al-Qadhafi's regime and against al-Qadhafi himself. To the Libyan nationals who suffered a lot throughout their history and who usually gain less when things are fine and lose more when things are not, it appeared that al-Qadhafi considers himself a World figure other than a Local leader (he did succeed in that, everybody knows who al-Qadhafi is.) He actually said in many occasions that the Libyans are no revolutionary people. Al-Qadhafi's obsession of leading Millions and Millions instead of leading few million Libyans lead him to concentrate on building his own image on the expense of building a nation and he relied extensively on non-Libyans to accomplish his goals. No nation in history rose to its full potential without its own nationals been fully respected and dignified and utilized. Another cause for the lost love between most Libyans and the Libyan revolution is that the military stayed in power longer than it should be. The military can overthrow governments but it can not build a good government. The real Opposition against Qadhafi started early seveties when the Libyan students movement launched its continuing demands for democracy and freedom. The student movement was clean and had no personal agenda and it opposed al-Qadhafi for no personal gains. First, al-Qadhafi opened a dialouge with student leaders then he abandoned that and started jailing students and he even executed some of them in public. In the late seventies and early eighties the opposition against al-Qadhafi began another phase when many Libyans , students and non-students abroad, joined political parties, unions, national fronts and organizations opposing al-Qadhafi regime. Basic facts about the abduction of Mansour al-Kikhia: Who kidnaped al-Kikhia? In the nineties the opposition entered a new era of its existence when the Islamic groups inside Libya began their armed struggle against the Libyan regime. Every other week clashes between Islamic groups and al-Qadhafi security forces are reported and some believe that this is the strongest opposition that al-Qadhafi ever faced in his 30 years as a leader of the Libyan government. But , Mu'ammar al-Qadhafi now understands world politics much more than when he was a young officer in the Free Unitary Officers movement, he certainly will try to defuse this new, fresh and strong opposition against him and make the Islamic groups in Libya not just facing his forces but also the Arab and International politics which might not allow these groups to succeed in their efforts to topple al-Qadhafi.